This USB device adds an RS-232 serial port to your PC or laptop computer. The serial connection is provided as a DB9 male connector. This device is a perfect addition to many of today's newer PCs and laptops which do not include built-in RS-232 ports. Many of these devices can be used on your computer at once, allowing you to add as many serial ports as you need. 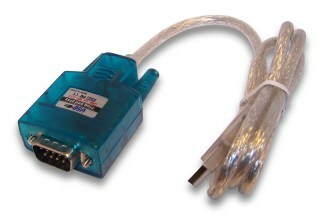 This is a USB 1.1 device, which may be used with a USB 1.1 or USB 2.0 port on your computer. Drivers are included on a disc and can also be downloaded below. See below for operating systems supported. Oddly, the latest driver version from Prolific does not support Windows 8 or Windows 10 (Windows 7 is supported). The older driver (v3.3) has been found to work, but is not officially supported. If you have already installed the newer driver and later install the older driver, you will need to tell Windows to begin using the older driver by finding the device in Device Manager, selecting "Update Driver Software", "Browse My Computer", "Let me pick from a list of devices" and then choosing the driver that shows version 3.3.17.203.